Relationships fail because couples lacks the skills to talk about the hard things in life. Fortunately, this one simple practice is something any couple can do and makes a huge difference. Being able to talk to our partners about the really difficult subjects and resolve hard conflicts is the difference between relationships that thrive and those that fail. If we can’t really talk, it often leads to fighting or distancing. Our attractions shrivel and we can’t remember why we once felt so in love. It’s so terrible to feel our love melt away in the face of anger and defensiveness. Yet being close to another brings conflict. If we don’t know how to have a healthy conflict, it can destroy our most precious relationships. Fortunately, a few skills can transform these moments and enable you to easily talk about even very challenging subjects. This week’s video will share one skill that really makes a difference. Learning to talk to our partners about difficult subjects is crucial to having a relationship that thrives, particularly when it is comes to conflicts. Unfortunately, few of us know how to resolve a fight in a way that actually leads to healing and increased intimacy. So today I want to tell you about one thing you can do with your partner that for me has made a huge impact on my relationship. When my wife and I have something that is difficult to talk about, we very simply sit down, facing each other and set a timer for five minutes. Then one of us talks for those five minutes. It is a time to really say anything, especially the scary things that we really don’t want to say. Usually we start with the person that is more triggered. Then we swap roles. We go back and forth until the heat of the conversation is gone. Once the charge has dissipated and it is safe to talk about the subject, then we will stop with the timer and simply talk. If you are listening, really look your partner in the eye. Make sure they are aware that you are there, and hold all your reactions inside. Do not show if something is going on for you, just be present for them, sit there, and look them in the eye. There is no need to worry about saying it correctly or using ‘I’ statements, but obviously blasting your partner with a lot of rage is going to be challenging. See if you can express the anger or hurt directly rather than attacking them for what they did or didn’t do. I actually do this with my wife once a week. We have a scheduled time where we take about half an hour just to catch up on our relationship and share anything. It has been amazingly helpful for us to stay connected and to keep the baggage from building in our relationship. Anything that needs to be talked about, we trust we can put it there and get through to the other side. If something difficult comes up for me and it’s not a good time to talk, I know I can hold onto it and wait until we have the safety of this practice within which to share it. Sometimes, the level of hurt that we feel in relationships with our partners is so strong that this container is not enough and then we do need a couples therapist. It’s remarkable how much it can help to have a therapist step in and mediate the conversation so everyone can really feel heard and understood. There’s nothing wrong with getting help, as we all need it sometimes. Whatever hesitations you may have about seeing a therapist, do what you can do deal with them and go give it a shot. My wife and I have been to multiple couples therapists over the years and every time it has really helped. Thank you for joining me for another episode. 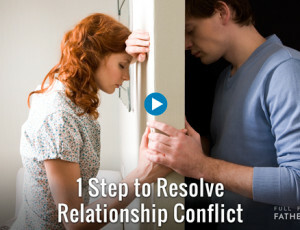 I would love to hear your thoughts about how you resolve conflicts in your relationship. Please join the conversation below, and I will see you next time for the next episode.